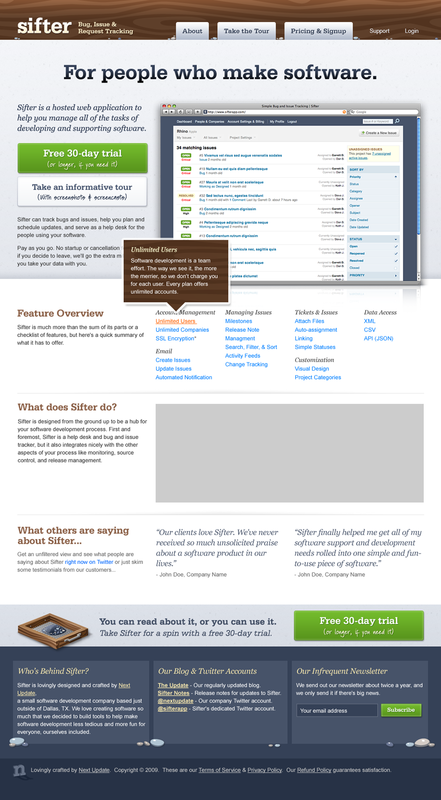 Total design overhaul of the Sifter product site. Jared: Could not be more pleased with the level of excitement and collaboration on this project. Garrett: Knocked out an elegant IA and provided excellent feedback & ideas. Seriously; I am crediting him right here and now as co-designer. Great ideas. 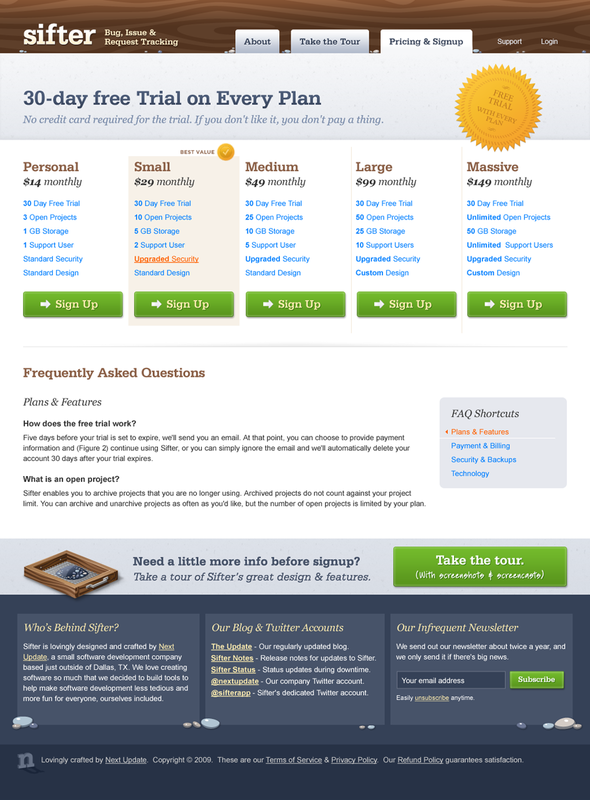 Sifter had been live for about 3 months when application creator Garrett Dimon began sending me ‘heads up’ messages that he was adjusting the flow & architecture of SifterApp.com and would like a new visual design to accompany the next version of the site. 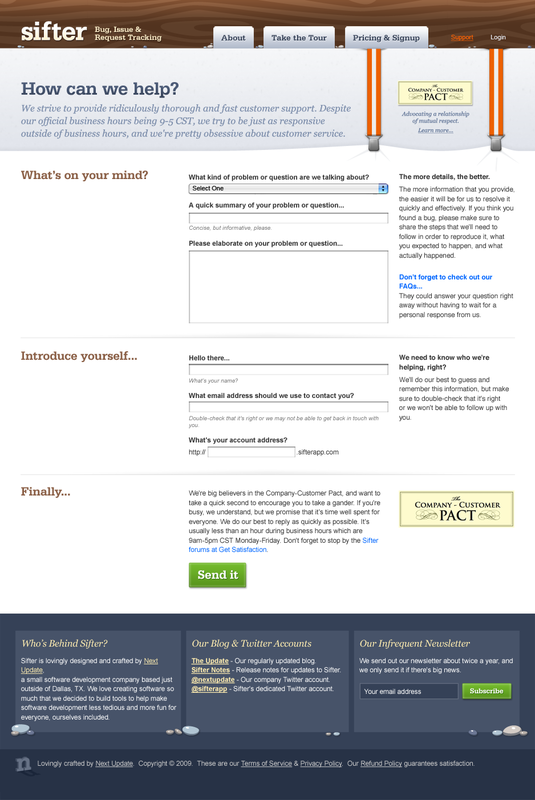 Having had the thoroughly enjoyable experience of designing the Sifter logo a year prior, I started thinking about how we could create a site built off the elements developed for the logo that would better promote the product and encourage signup. Visually, it’s a pretty dramatic change. The wood grain & pebbles from the logo have been generously repurposed and used in a playful manner. And right there in big bold type is “For people who make software,” followed up with a succinct description of the product and a clear call to action. My favorite element in this design has to be the suspenders on the Support page. This poor page was looking like the redheaded stepchild of the site, full of forms and other not very exciting things, until this idea came to me. Now it’s quite possibly the most interesting header on the entire site!